Get a glimpse at the first official artwork. Update: With his next game due to be officially unveiled this week, Edmund McMillen took to Twitter to share more information about the mystery project, along with its first official artwork. 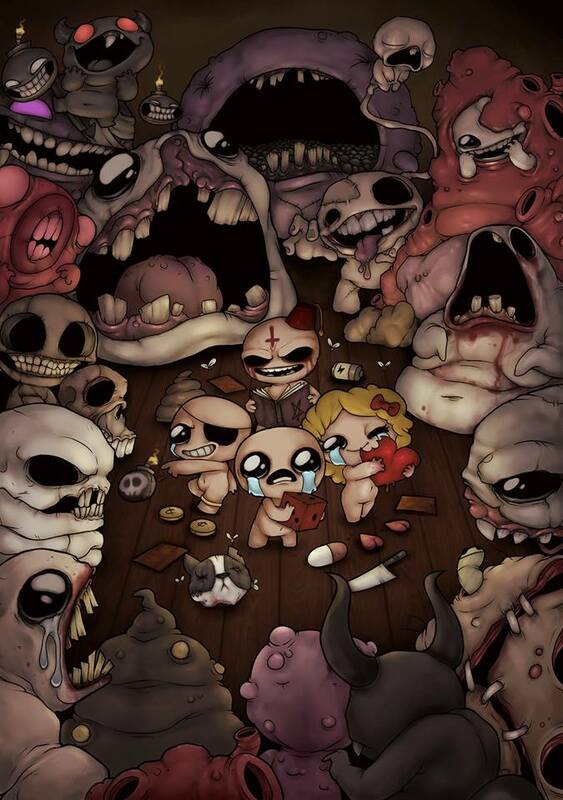 Previously, McMillen said he's working on a turn-based multiplayer game that's based on one of his old games but is not directly connected to The Binding of Isaac, Super Meat Boy, or his upcoming puzzle game, The Legend of Bum-bo. He's since clarified that it is, in fact, a Binding of Isaac game, but it's also something completely new. He describes it as "a spinoff that kind of connects the end of Isaac to ideas I have for a sequel," and it's set "after/during the end of the current game." It can only be played in local multiplayer. There is no singleplayer component, and you can't play online. McMillen says playing with four people "is ideal." It's a turn-based "casual strategy" game that uses cards. But while it is something of a card game, it doesn't have a mana system like Hearthstone or a land system like Magic: The Gathering. There are currently eight playable characters, and McMillen is working on more. Edmund McMillen has been busy. Six weeks ago, he released the final free content booster pack for The Binding of Isaac: Afterbirth+. A few weeks prior, he and James Id released the first trailer for their upcoming match-four dungeon-crawler, The Legend of Bum-bo. And a few weeks before that, McMillen said his delayed, cancelled and now revived game Mewgenics is back on track. Apparently McMillen's still got free time, though, because judging from a recent string of tweets, he's got a new multiplayer game in the works. With its official announcement still a few days away, little is known about McMillen's mystery project, but he did share a few interesting details on Twitter. Firstly, it's not connected to The Legend of Bum-bo, The Binding of Isaac or Super Meat Boy. And for those wondering: no, it's not a battle royale game. McMillen also held a dedicated Q&A, and assuming his answers are only half-joking, his mystery game is a turn-based, local multiplayer PvP game that's not a platformer or a shooter but is based on one of his old games. That oughta narrow it down.